What's makes a whiteboard smart, you may wonder? That would be two pens, a 4K screen, and the ability for anyone in or outside the room to collaborate. The essence of a whiteboard is that of a piece of paper and a pen, blown up and hung on a wall to optimize sharing. 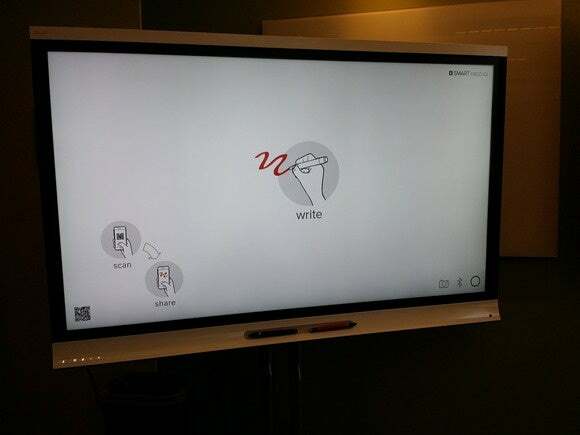 The Smart Technologies Kapp IQ digital whiteboard doesn’t go much beyond that, with one major exception: Anyone can write on it, without having to get up from their chair. Like your typical office or classroom whiteboard, the Kapp IQ allows you to draw on it—but what sets it apart from your average whiteboard is that you can then save a snapshot of what you drew on it for further review, without just taking a photo of the board with your smartphone. Teachers, who use a related Smart whiteboard designed for education, may sign up for hours of instruction on how to use it. But Smart has found that if enterprise users can’t grok how to use it in five minutes, they give up. “The question is, how could we make it massively simple?” said Warren Barkley, Smart’s chief technology officer. The Kapp IQ has a red pen, and a black pen. It’s about as basic as you can get. And simple it is. I spent some hands-on time with a 55-inch enterprise Kapp IQ, which measures 33.675-by-50.75-by-4.75 inches, weighs 107 pounds, and retails for $4000. The enterprise version of the Kapp IQ is also available in a 65-inch model for $5000, and a 75-inch and 84-inch model are both in the works. All of the models will be based upon 4K panel technology, Barkley said. In whiteboard mode, the resolution is 1920-by-1080; otherwise, it’s a 3840-by-2160 display. The most impressive thing about the Kapp IQ is how it allows pretty much anyone in the room (or remotely connected) to see what’s being written on the screen. More importantly, anyone can interact with it. If you have an NFC-enabled iOS or Android device, you can take a picture of the whiteboard’s QR glyph at the lower left to trigger a Bluetooth connection, which connects the whiteboard to the mobile device. Once connected, each user can draw on his or her mobile device, and it will instantly be displayed on the Kapp IQ’s screen. Conversely, any drawings made by the presenter on the Kapp IQ are pushed to each connected mobile device in real time. The presenter and participants can click a camera button to save a snapshot of what’s on the board, which then gets stored on each participant’s mobile device. Presenters can invite remote users to the shared discussion via a randomly-generated URL that works with any Web browser, which allows remote users to draw on the screen (through their mobile devices) and receive snapshots as well. Kapp IQ saves those snapshots to the session, allowing users not only to have a visual record of what was said, but also to pick up where they left off. (Users can also save the images to a USB stick that can be inserted into a connector on the side.) In the next several months, Smart will add a smart “video” feature that will track additions and subtractions to the whiteboard, skipping over sections where nothing happened. The Kapp IQ can connect up to 250 users simultaneously; in that scenario, Barkley said there isn’t much latency—but there can be a sort of “drawing war,” where people introduce edits, then others would edit those edits, resulting in a whiteboard projection that is constantly in flux. Smart previously worked on the Lync Room System with Microsoft, and Barkley said that he was part of the deal that brought Perceptive Pixel to Microsoft. 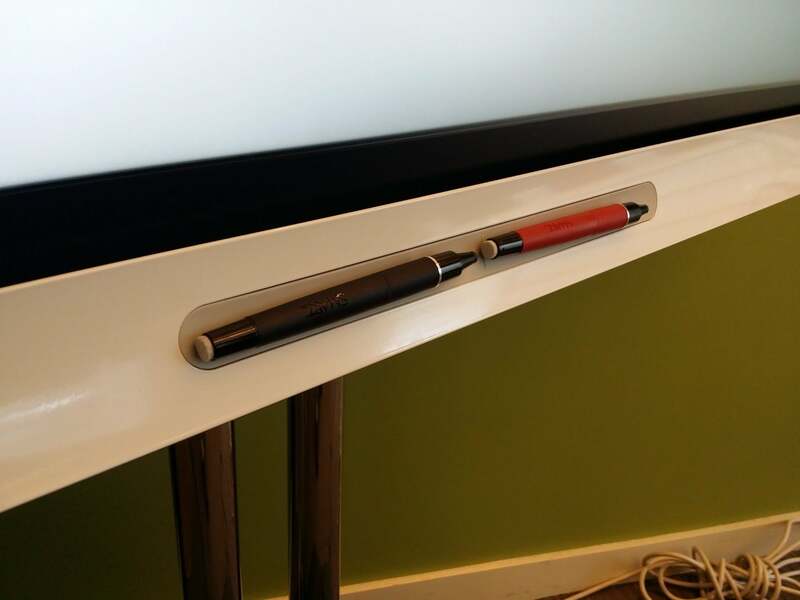 Perceptive Pixel’s technology later evolved into the Surface Hub, which Microsoft has delayed until January. Microsoft is pitching the Surface Hub as a sort of Lexus of collaboration, with integrated Skype windows and the like; the Kapp IQ is more of a Volkswagen Beetle. In the current iteration, even a 4K screen fills up fast. Barkley said that the company had tried out an “endless canvas” with a radar view, so that users could see who drew what, and where. Surprisingly, children who tested that interface in a classroom setting understood it intuitively, but the adults who tested the new interface didn’t catch on. So, the company dropped it, opting to keep the focus on simplicity. Barkley’s right. The Kapp IQ is extremely simple to use, enough that users may begin to wonder why they spent several thousand dollars on it. But a focus on keeping it simple isn’t necessarily a bad thing. After all, how many minutes per meeting are wasted just getting everyone connected? Correction: Barkley is Smart's chief technology officer, not chief technical officer. And one of the pens is indeed red.